Villa Saanti faces west across the Andaman Sea, its two-storey main pavilion and four glass-walled sleeping pavilions framing two huge swimming pools, and looking out across palm-dominated gardens to the beach. Entering the main pavilion, you find the dining and guest kitchen area on the left and the lounge on the right. Beyond the lounge is the media and entertainment room. Upstairs is the huge master suite and a guestroom, and in front of all this is an enormous shady terrace and the 20-metre main pool, which spills into a second pool - looking out over the garden. And beyond the garden is the glorious deserted beach. Meals at Villa Saanti are served, unless otherwise requested, at a long, elegant 12-seat table in the dining area on the ground floor of the main pavilion. A second dining table on the veranda, can seat eight people. To the far side of the dining room is a well-equipped guest kitchen for those who enjoy a little therapeutic holiday cookery (though with a skilled chef in residence, perhaps not unsurprisingly, few actually do). There is also an excellent coffee machine and wine cooler here to ensure the red, white or rosé is always at the perfect temperature. Next to the dining area is the über-comfortable living room, the place for snoozing or reading through shady afternoons, or for relaxed conversation after dinner amid the chocolate brown décor and furnishings dominated by an antelope skin rug and a huge bird cage. Next door to that is the entertainment room, with its 55-inch flat-screen TV, DVD player and satellite receiver or, for the more energetic, the villa’s Wii system. WiFi is available in every room, throughout the villa grounds and onto the beach, and a Sonos sound system allows guests to play their favourite music just about anywhere in the villa. Upstairs, past the master bedroom, is the gym, equipped with rowing, cycling and jogging machines, along with weights and exercise balls. An absolute beachfront holiday in Thailand is all about making the most of the sunshine and the outdoors. With this goal in mind, Villa Saanti is arranged around a huge sand-wash deck furnished with sun loungers, and a barbecue area equipped with a wood-fired pizza oven. 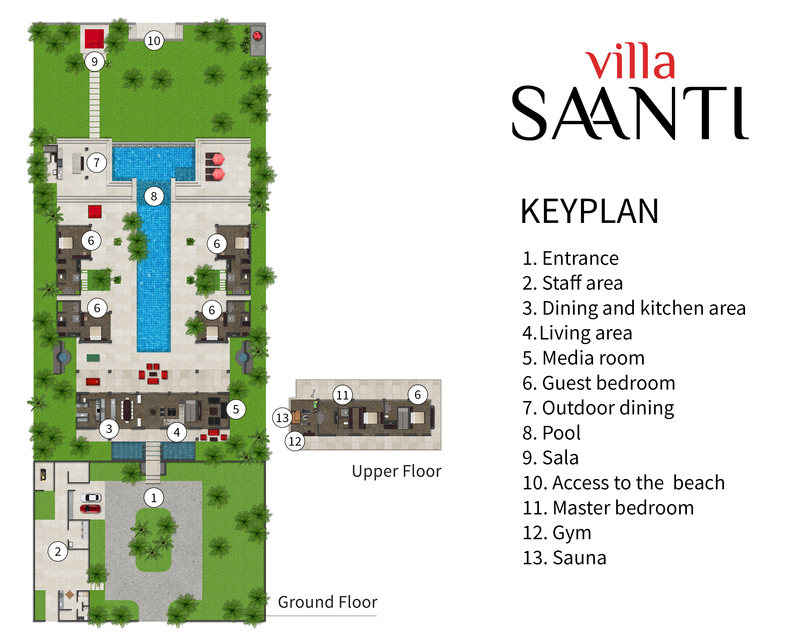 Taking pride of place at the centre of the estate are the villa’s two stunning infinity-edge pools. The larger one, measuring 20 x 5 metres, spills into the smaller one, designed for children and jacuzzi lovers, and measuring 12 x 3 metres. To the front of the lawn, under soaring coconut palms (the land on which Villa Saanti stands used to be a coconut plantation), is the beachfront sala, with its sunken seating inviting lazy conversation, reading or just gazing out across the sea to the horizon. Just beyond, on the sand and in the shade of screwpine and sea almond trees, are six more sunbeds and one of the world’s most sublime views – the sapphire-and-emerald sea and cobalt sky. The huge master suite takes up most of the upper floor of the main pavilion at Villa Saanti, with floor-to-ceiling glass sliding doors opening onto a balcony and wide views of the Andaman Sea. The master bedroom has an ultra-comfortable king-size bed, blutooth speakers and a 55-inch TV with DVD player. The room is cooled by air conditioning and ceiling fans. Its ensuite bathroom has a double vanity, rain shower-with-a-view and a separate WC with bidet. Adjacent to the master suite, this air-conditioned guest bedroom also has a king-size bed and an ensuite bathroom with double vanity, sunken tub and rain shower. Villa Saanti has four almost identically sized guest bedroom pavilions, all opening through wide glass doors to the pool and gardens. Each is equipped with air conditioning and a ceiling fan in its pyramid-shaped roof, a deliciously comfortable king-size bed and a chaise longue. Ensuite bathrooms are fitted with double vanities, rain shower, separate WC and an alfresco tub for bathing under the stars. A 33-inch flat-screen TV with satellite connection, and blutooth speakers provide entertainment.